Check out Tobi's Irene Blouse Breeze through in the Mint Irene Blouse. Bring those boho vibes with you in this peasant blouse design featuring a front tie neck with exquisite detail along the front. Wear this long sleeve blouse effortlessly in warm weather with short shorts and sandals. Breeze through in the White Irene Blouse. Bring those boho vibes with you in this peasant blouse design featuring a front tie neck with exquisite detail along the front. Wear this long sleeve blouse effortlessly in warm weather with short shorts and sandals. Breeze through in the Taupe Irene Blouse. Bring those boho vibes with you in this peasant blouse design featuring a front tie neck with exquisite detail along the front. Wear this long sleeve blouse effortlessly in warm weather with short shorts and sandals. Breeze through in the Mint Irene Blouse. Bring those boho vibes with you in this peasant blouse design featuring a front tie neck with exquisite detail along the front. Wear this long sleeve blouse effortlessly in warm weather with short shorts and sandals. 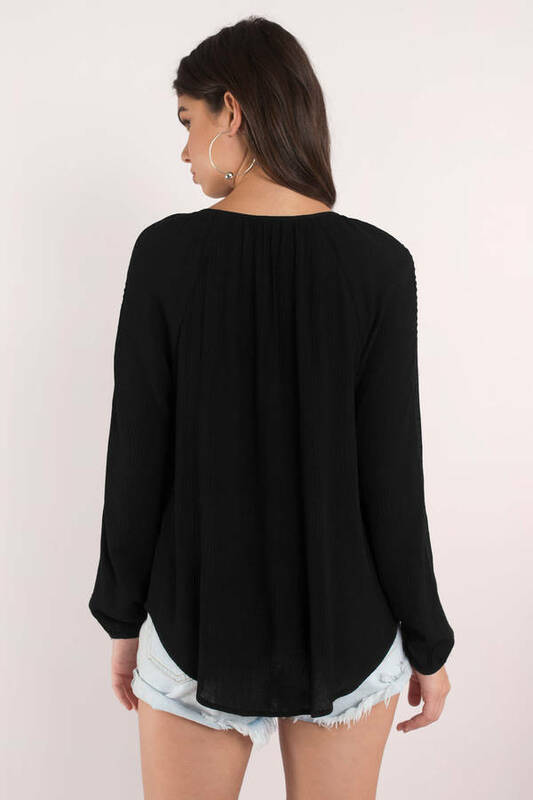 Breeze through in the Black Irene Blouse. Bring those boho vibes with you in this peasant blouse design featuring a front tie neck with exquisite detail along the front. Wear this long sleeve blouse effortlessly in warm weather with short shorts and sandals. Mint, Taupe, White modeled on a size Small.